The teenager also hit the branch of a tree during her fall. 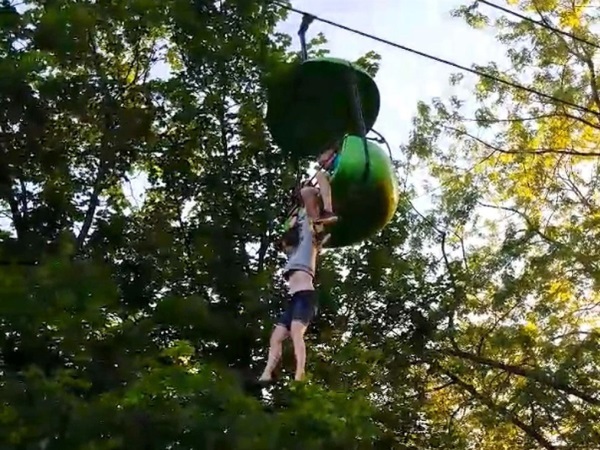 A teenager had bystanders on edge when she fell from a stopped gondola ride, about 25 m above the ground, at a New York amusement park. A video taken by an eyewitness, Loren Lent, shows the panicky 14-year-old dangling from the ride at the Six Flags Amusement Park, while people gathered at the scene can be heard screaming in the background and some of the amusement park personnel stand around to catch her. The teenager, from Delaware in the US, also hit the branch of a tree during her fall. The eyewitness who took the video told WRGB-TV that people scrambled to position themselves in such a way, that they could catch the girl should she fall. "It was horrifying. I mean, you know, you could tell this person is helpless," Lent told the station. According to reports, the girl, who has not been named, was taken to a nearby hospital with serious injuries. The amusement park said in a statement that the Sky Ride was in a "working condition" and it appears there was "no malfunction" on the ride. It is still unclear what caused the girl to fall from the ride. She was in a two-seater ‘car’ and the man seated next to her is has also not been named.